Educators often don’t want their students to use their own email address for creating online accounts. Unfortunately unique email addresses are important for password resets and deleting blogs. The gmail+ method provides the solution! How it works is you create one gmail account for your class. For example, mathiscool@gmail.com or room16@gmail.com. Then you use your one class gmail account with the gmail+ method to create each student account. Gmail ignores any letters and numbers you add after a + sign and sends all emails to the one account while our system thinks each is a unique email. You must use a real gmail account– either use your own gmail account or set up a gmail account for your class e.g. room16@gmail.com. 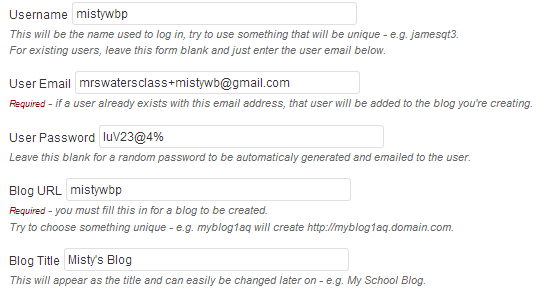 This also means that if you want to moderate comments on student posts they will be sent to your class email address. Also all password resets will be sent to your class email address.